And more, see our Services page! 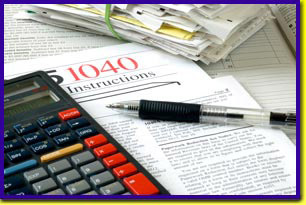 We have been providing Professional Income Tax Preparation since 1989. Our office in South Easton, MA is next to Brockton, MA. We also have a location in Auburn, MA next to Worcester, MA. This year, many tax returns will be directly affected by new legislation signed by our President. In addition tax rates, exemptions, and deductions are annually adjusted for inflation. To deal with the constantly changing tax rules, we study and equip ourselves year-round to understand the never-ending regulation updates. We are familiar with software glitches and have insight about frequently overlooked deductions. Often, discussing your tax matters with a professional tax preparer not only pays for itself, but also offers you a learning experience that will help you better structure your financial decisions for future tax savings. Many clients think of their tax preparers as someone to consult just one time a year, but they really should be using us as a resource the entire year. Clients should consult a tax professional when they are: obtaining a mortgage, considering a major investment, selling stocks or bonds, liquidating a retirement account, starting a new business, or selling their home, to name a few important times. Life changing events such as a: Marriage, Birth, Death, or Divorce are critical times to consult a tax expert. We are Income Tax Specialists who are available year-round, to assist you with all your tax needs. New Clients download your $20 saving certificate! This website is for guidance only, and professional advice should be obtained from qualified professionals before acting on any information contained herein. The publishers do not accept any responsibility for loss occasioned to any person as a result of action taken or refrained from in consequence of the contents of this publication. We try to ensure the accuracy of all of the content. However, we do not accept any liability for the use made by you of the content. The content of this site should only be used for information purposes. It is not advice and you should not rely on it to make (or refrain from making) any decision or take (or refrain from taking) any action. The rights in the: designs, logos, photographs, and non-public content of this site are owned by or licensed to Maloof & Associates Inc. They are protected by copyright, trademarks and other intellectual property rights. You may not copy, reproduce, modify, distribute, republish, display, post or transmit any part of this site without the written permission of Maloof & Associates Inc. You may view or print individual pages only for your own personal use.